Marvel Studios, and in particular their producer extraordinaire Kevin Fiege, cannot be championed enough for the consistently terrific work they have been doing over the course of the last 6 years with their 'Marvel Cinematic Universe'. Since the 2008 release of Iron Man, they have cemented themselves as the dominant creative force in the superhero genre, a new tentpole of the blockbuster market that they have not only been enormously instrumental in establishing so successfully, but also one that their efforts have seen confidently go toe-to-toe with the likes of Nolan's Batman universe and last year's Superman reprise and still come out smiling. What remains particularly commendable is how consistently entertaining, characterful and diverse their output has been, brilliantly capturing the tone and identity of the comic book characters they clearly invest a tremendous amount of passion and enthusiasm into realising on the screen, and masterfully weaving the overriding 'Avengers' narrative with distinctive, individual solo stories for their roster of characters. It has been so almost flawlessly executed (Iron Man 2 was regarded as something of a mixed bag) that both fans and cinemagoers have been kept wondering when, and if, the Marvel magic is going to lose its fire, and which will be the first release to truly drop the superhero ball as it were. 2012 saw the megahit that was Joss Whedon's The Avengers (Avengers Assemble in the UK) hit new heights in terms of both creativity and box office/critical success, and last year saw two perfectly solid and entertaining sequels in the form of Iron Man 3 and Thor: The Dark World. And now, the first of Marvel's 2014 releases sees what is in many ways The Avengers' most direct follow-up yet in the form of Captain America: The Winter Soldier. Featuring no less than 3 of the central Avengers' characters, as well as a plot revolving very heavily around the key S.H.I.E.L.D organisation, Winter Soldier had a lot of aces in play and was managing a lot of key components within their 'cinematic universe'. If any film was going to be the one to go overboard or hit a snag, it was looking increasingly likely that this would be it. Fortunately, the reality couldn't be any further from that being the case. 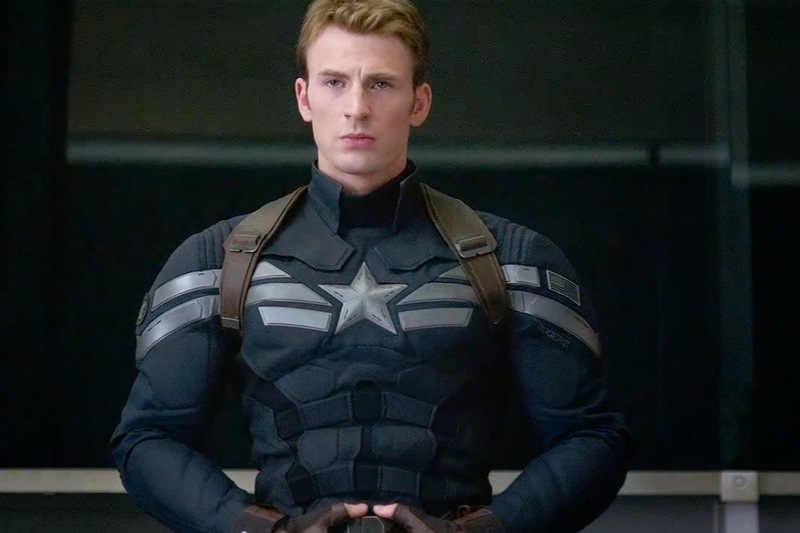 By taking the spectacle and craft of the preceding films and mixing them in with a surprisingly efficient and involving politically-charged script, Captain America: The Winter Soldier is taut, thrilling moviemaking which stands head and shoulders with the finest marvel, and indeed the genre, can offer. Steve Rogers, A.K.A Captain America, is continuing to try and find his place in the new world he has awoken into, settling into the way of modern life since the events of his thawing and The Avengers. 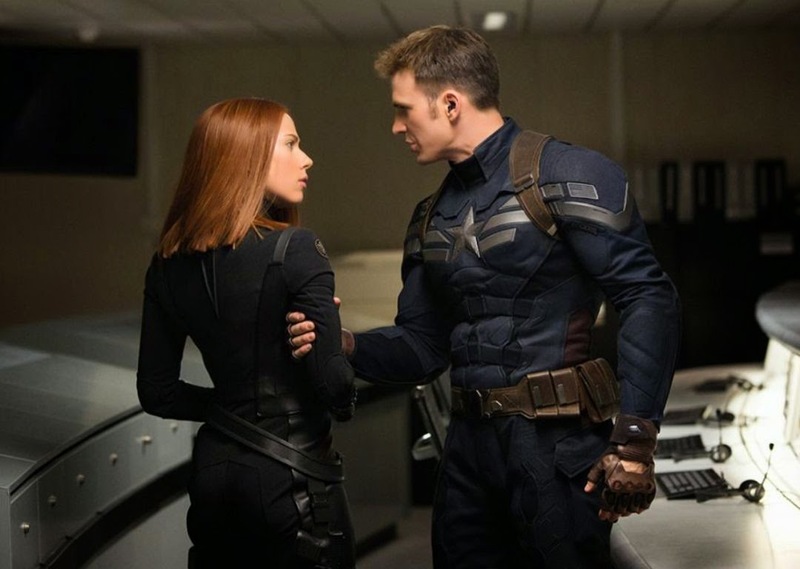 Occasionally partnered with fellow Avengers Natasha Romanoff A.K.A Black Widow (Scarlett Johansson), the two have formed a mutual respect and friendship which, mercifully, the film doesn't attempt to shoehorn into anything more than that. 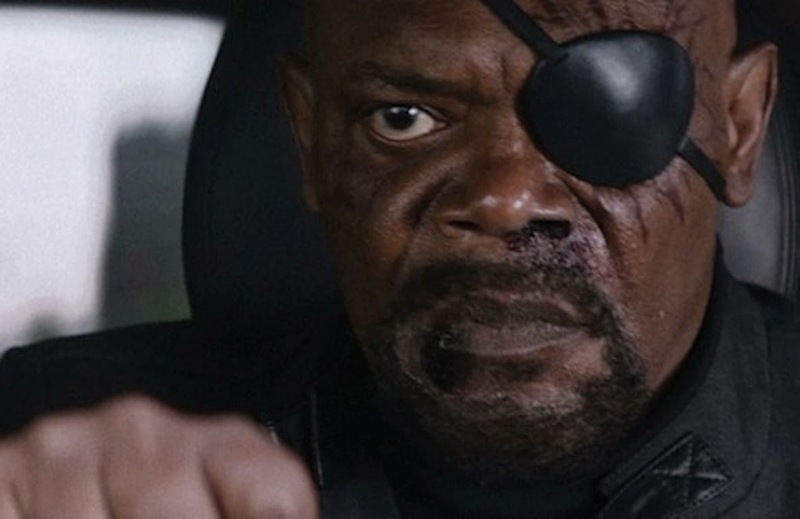 After a breathtaking opening mission, signs begin to show that all is not well with their directive organisation S.H.I.E.L.D, with suspicion and cast falling upon even its current director, and Rogers' mentor of sorts, Nick Fury (Samuel L. Jackson). 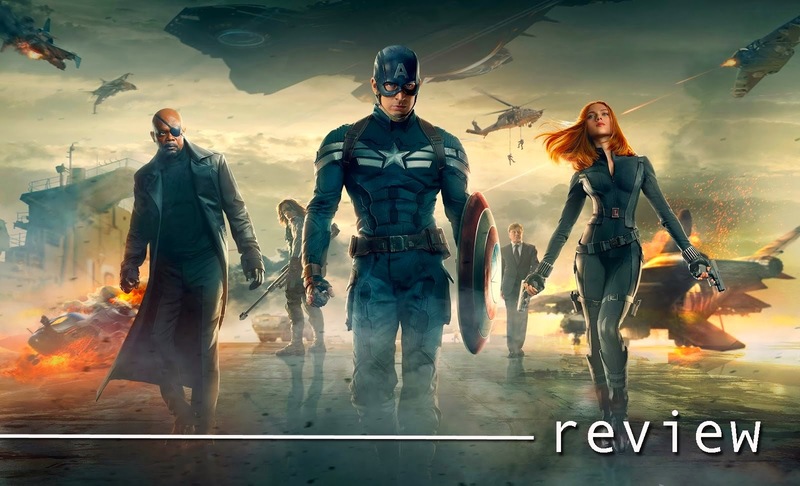 As the tension and distrust begins to mount and an assassination is put out on a key figure, Rogers and Romanoff must team up to uncover the truth behind the growing threat which goes deeper than they feared and transpires to have both global ramifications and a new foe in the form of the formidable, titular Winter Soldier. The first half of Winter Soldier in particular operates more as a somewhat heightened political thriller as opposed to typical superhero fare, and writers Christopher Markus and Stephen McFeely (who also penned last years Thor: The Dark World) and directing duo Anthony and Joe Russo do a superb job of crafting a tense, engaging interplay of subterfuge, mistrust and even political paranoia whilst also injecting plenty of the universes quintessential visual flair and action. The characters, likewise, continue to shine, and whilst Captain America himself naturally has to be something of a fairly linear, wholesome figure by necessity (if a little more willing to defy authority here), there is a very welcome development and rounding out of the likes of Scarlett Johansson's Black Widow and Samuel L. Jackson's Nick Fury in particular. Whereas in previous films they've been more streamlined and broad as characters, here they really begin to feel like dimensional, nuanced individuals, and both Johansson and Jackson continuing to put in spirited, charismatic performances. Still, there's no mistaking this as anything other than a superhero outing, and there's no feeling of genre confusion or an attempt to steer away from the tropes and expectations of the genre. The fight choreography and action sequences are exquisitely shot and extraordinarily well choreographed; frenzied yet fluid to the point of being almost balletic, and all masterfully edited to produce by some margin the franchises most thrilling and well-executed action yet. Indeed, by the time the suitably grandiose and showy finale comes round and the set pieces have become increasingly more spectacular and showy, as clever, twisting and involving as Winter Soldier's narrative may be, masterfully dipping in and out of the Captain America back-story to powerful effect, even the most ardent adrenaline junkie should find themselves utterly satisfied by the terrific action and opulent carnage on display. It isn't perfect by any means. For all of the genuinely brave and surprising twists and developments that the story throws at us (some of which will genuinely shock fans of the franchise), there are a couple of moments that feel so obvious and signposted that I had hoped they were in fact double bluffs due to their glaring predictability. Similarly, within the confines of the post-Avengers universe that has been established by Marvel, it is difficult to fathom Robert Downey Jnr. 's Tony Stark/Iron Man not finding himself interested or involved in such pivotal and relevant events. Robert Redford is brilliant as predominantly featured S.H.I.E.L.D executive Alexander Pierce, admirably steering away from hamming up his role and instead grounding it in an earthy reality, with Redford's presence alone naturally helping to sell the conspiracy thriller elements of the plot that there are given his earlier filmography (Three Days of the Condor, in particular, is evoked here, as well as shades of The Manchurian Candidate). But again, some of the directions his character is taken in feel a little obvious from the offset. 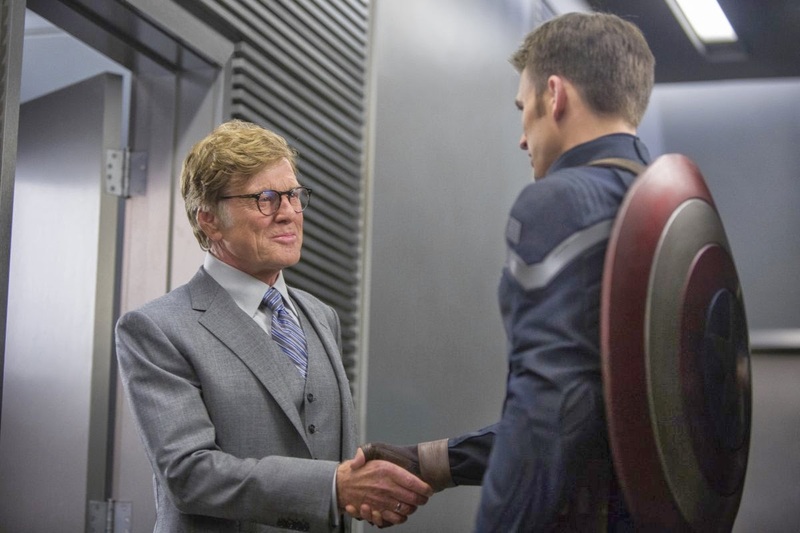 Still, Redford is a very welcome addition to the franchise, and is a decidedly more engaging character than fellow newcomer to the series Anthony Mackie, whose Sam Wilson is far more interesting earlier in the film as a figure of empathy for Rogers when touching upon issues of survivor guilt and post traumatic stress than when he suits up as 'The Falcon' and essentially becomes Iron Man-lite. Captain America: The Winter Soldier is an all round extremely well-crafted and consistently entertaining and involving film. Its conspiracy thriller flavourings come from a balanced, intelligent script that may compromise a little on personality and humour at times, but feels more impacting and meaningful for taking its core narrative so seriously. It offers some key developments for the Avengers franchise that were genuinely surprising to have taken place in a solo outing and sequel such as this, and overall feels like by some measure the most important instalment since The Avengers back in 2012. Yes, it's still a touch silly in places, but this is Marvel we are dealing with after all, and not another foray into Nolan territory, and the quintessential injection of occasional tongue-in-cheek nudging and winking or absurdity and the likes of another hilarious Stan Lee cameo all feel natural and par for the course. At times almost breathlessly entertaining and boasting an intelligent, twisting narrative peppered with terrific action and continually well realised characters, Captain America: The Winter Soldier is another class act outing from Marvel studios, and is in many ways their strongest film yet. You'll want to be familiar with at least the original Captain America as well as The Avengers to get full mileage here, but even those who aren't will find a surprisingly mature and confident thriller wrapped in plenty of superhero spectacle and excitement as well as that quintessential Marvel ingredient: Fun. Press access for this screening of Captain America: The Winter Soldier was provided by Walt Disney Motion Picture Studios UK. (A)musings Media gratefully acknowledges their generous invitation. Aweomse review bro. Stoked that everyone is saying its the best avengers film yet! Do you see scarlet witch at all? A solid example of meat-and-potatoes popcorn filmmaking--befitting that most meat-and-potatoes of comic book heroes. The primary arc of the movie is very well done. It manages to keep enough hidden to be suspenseful while also not feeling like totally random events are just happening for no reason. The ending sequence is a great way to spend a lot of money on special effects, but plot-wise it doesn't make much sense. Ironman only has the one primary character, and Avengers has a few too many, but Cap2 seems to land in the sweet spot with two main characters and a third that joins midway in.